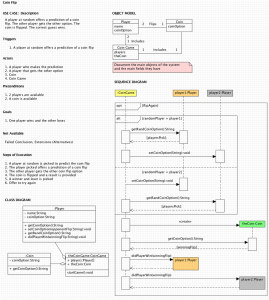 In the previous part of my Object Oriented Design Tutorial, I showed you how to build a Use Case, Object Model, Sequence Diagram and Class Diagram from scratch. In this tutorial, I show you how to turn those diagrams into code and a working program. 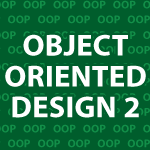 This is the process a person goes through to create excellent Object Oriented Designs. The code follows the video along with the digrams from last time. C++ would be great, if you can do it. I’d like to have it on PHP. But you’re videos were great. Thanks for sharing. Great video series (as they all are)! One slight bug in the code is that it appears the coin is only flipped one time instead of once per game. (Random coin flip occurs in Coin’s constructor and a Coin object is only created once.) Still, I wish I could write virtually bug-free code off the top of my head as you can! The code in the video had players and player in CoinGame constructor instead of player and player. The code is correct in the hand out. Also the code ran correctly in video, so you may have edited it. Just an observation. Sorry about that. Yes I do these tutorials out of my head so on occasion a little error slips in. the string winningFlip in class CoinGame doesn’t change, so I moved line 5 inside startGame method. thank you so much for the effort of putting those videos together! I’m in the process of learning Java right now and your tutorials are making it so much easier to digest. Awesome work! Hello Marc, I’m very happy that they are helping 🙂 Many more videos are coming. Yes you could, but it wouldn’t be that easy. You’d just convert the C# code into the native assembly language of the host computer that runs it. Engineering a Compiler is a pretty good book on compilers.